The kind of story you can hear again and again, until the very thought of it brings a Pavlovian craving of the dish itself. 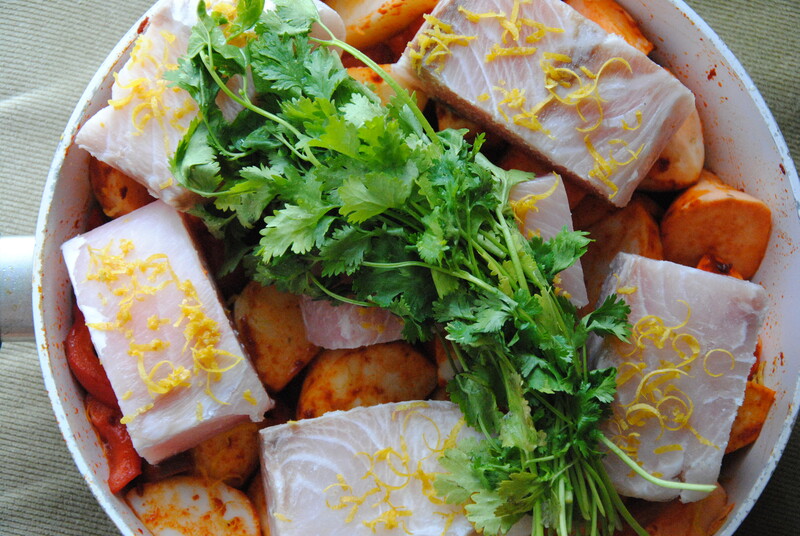 The kind of story that makes you laugh, or cry, or think about the sheer luck and chance that brought this recipe to our family’s table. The same luck that brought any family around any table, actually. Lovely coincidences that make up the fabric of our lives. The kind of story that you eventually find re-telling to your new family, after you start one. The kind that when you do, makes you miss your family’s dinnertime story-telling traditions very much, that makes you vow to make a point of noting and capturing these stories in your life, to tell your children someday. To keep the stories going. This dish tells the story of my parents, then still a young couple living in Jerusalem with two very, very small children – my brother and I. We lived on the top floor of a three-story building in a neighborhood that is very classy today, but then was just a normal place to live (actually, today that neighborhood is also “just a normal place to live” – it’s just that outside of it there are few normal places left). A couple of weeks into moving there, one fateful Friday morning, my parents were coming up the stairs to our apartment when suddenly the most wonderful smell of cooking reached their nose. Now, this is something I still love about living in a crappy apartment-building in Jerusalem: On Fridays, as people are preparing for their Shabbat meals (Friday night meals which are normally most people’s quality-time with their families, as well), the aromas from each apartment seep into the stairwell of the building, each floor offering its own unique palette of delicious smells, almost beckoning you to come into each apartment and volunteer to taste-test whatever is cooking in the pots. Never ones to be normal, seeing as the door opposite ours was wide open, and as there was an insanely good smell of cooking coming out of it, my parents decided to go inside and “investigate”. And that’s how they first made friends with our neighbors, who thankfully also didn’t really give a damn about norms. 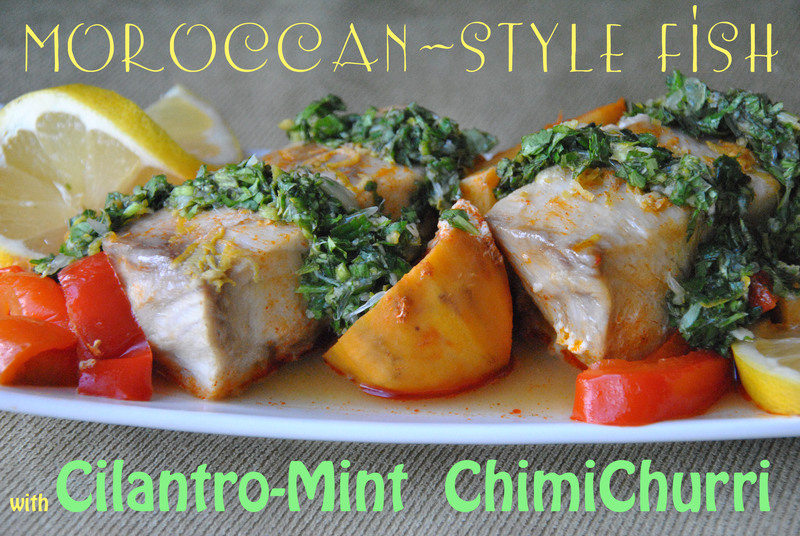 It’s also how they got this amazing recipe, because the smell that was driving them crazy was actually Moroccan-style fish. It’s crazy the ways in which life leads us. Crazy lucky, if you ask me. 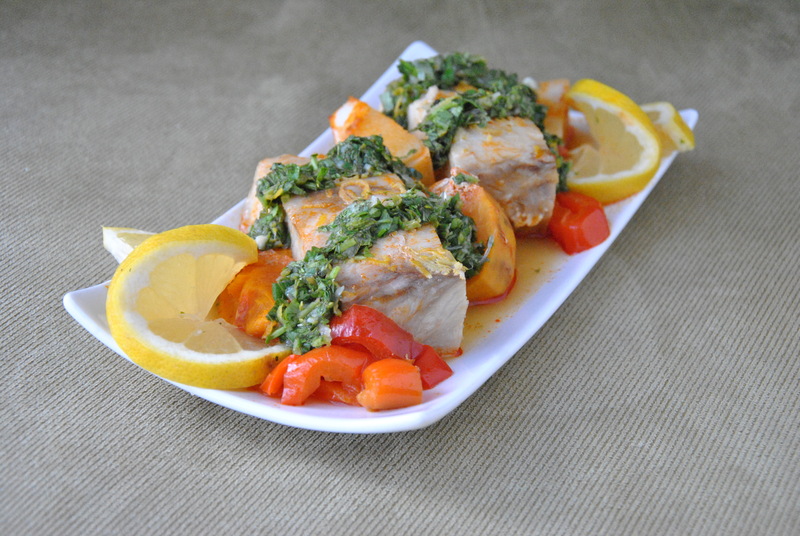 One of the things that will most affect the outcome of this recipe is the kind of fish you use. The other is using enough paprika, but we’ll get to that later. 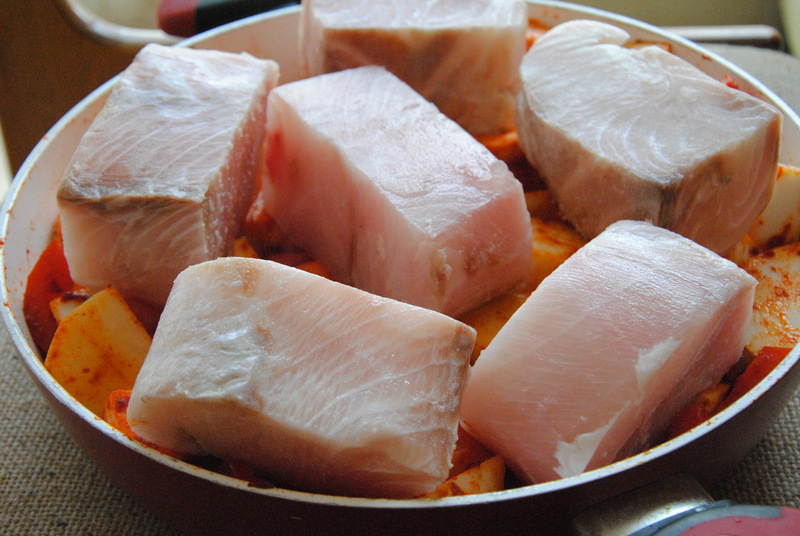 The right fish will normally be a white-meated fish, usually (but not always) a freshwater fish, and generally a meaty one with substance. A good rule of thumb is to choose fish whose texture and flavor you like when it is prepared in the most minimal way (as in, not the kind of fish you will only eat breaded and deep-fried or with a ton of overwhelming flavoring). It is also best if the fillets are on the thicker side. 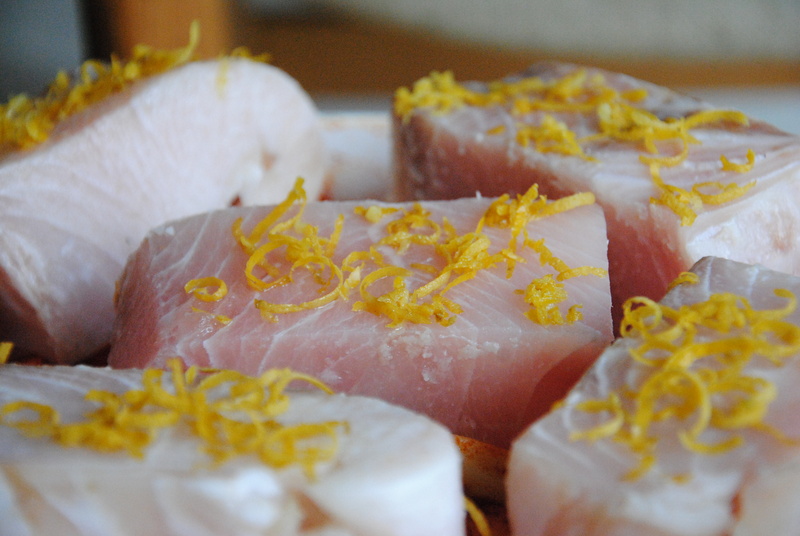 I like to use tuna, mahi-mahi, Nile perch, or mullet. The weight I gave in the ingredients list is pretty much an estimation. I find that this weight can be divided into six very satisfying portions. 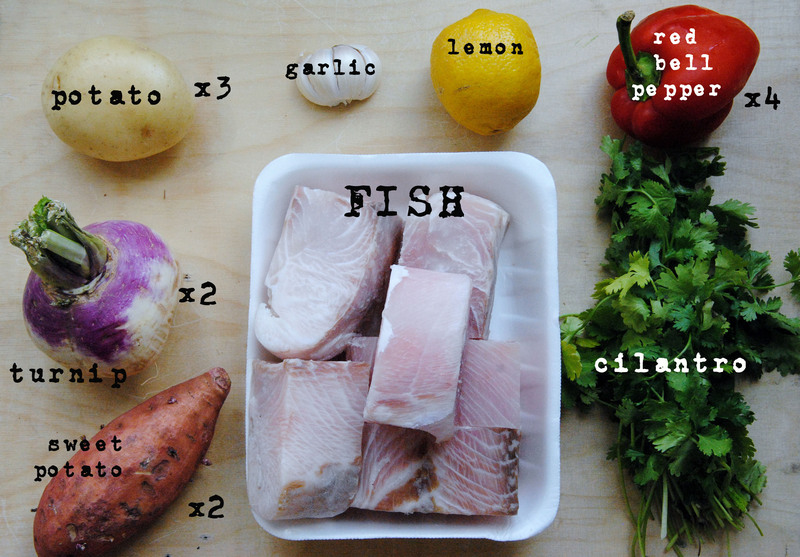 You can obviously use more or less, depending on your needs, but I really think that it’s a good idea to have the fish pre-divided into as many portions as you plan to be serving. This is because no one I know will actually stop to think that maybe he/she should divvy up this giant chunk of fish with someone else – they will just feel like winners for getting such a big piece. Seriously though, it’s really hard to convince people to share this fish so you’re better off dividing it right from the start. 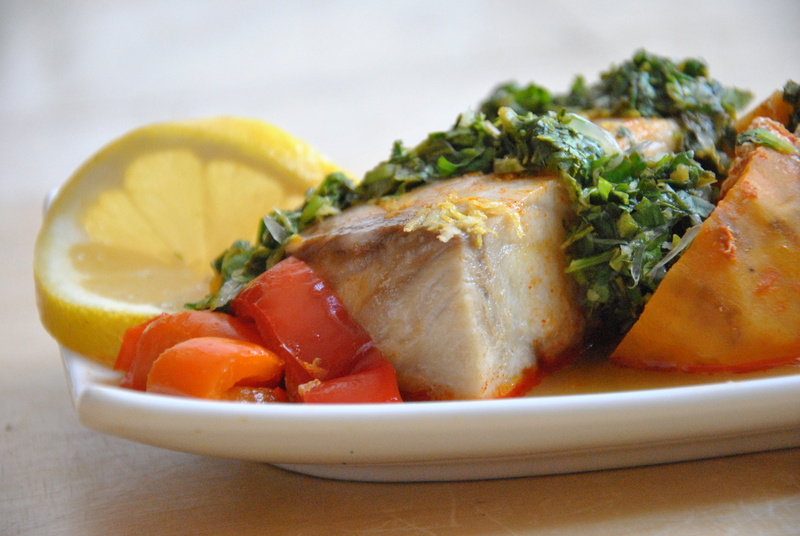 If you feel like the flavor of your fish is too strong and you want to mellow it out a bit, let it sit in lemon juice for a few minutes while you prepare the veggies. 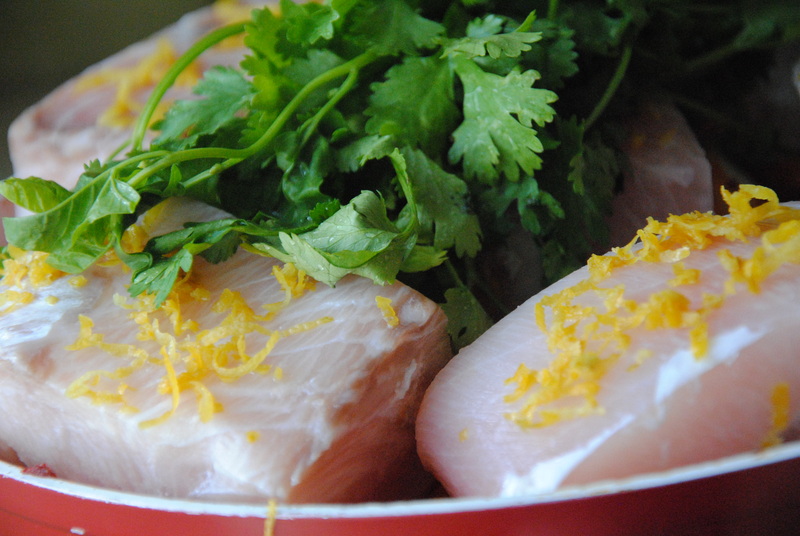 Two words of caution: One, the lemon juice actually cooks the fish as it sits in it, so don’t leave it in there for too long. 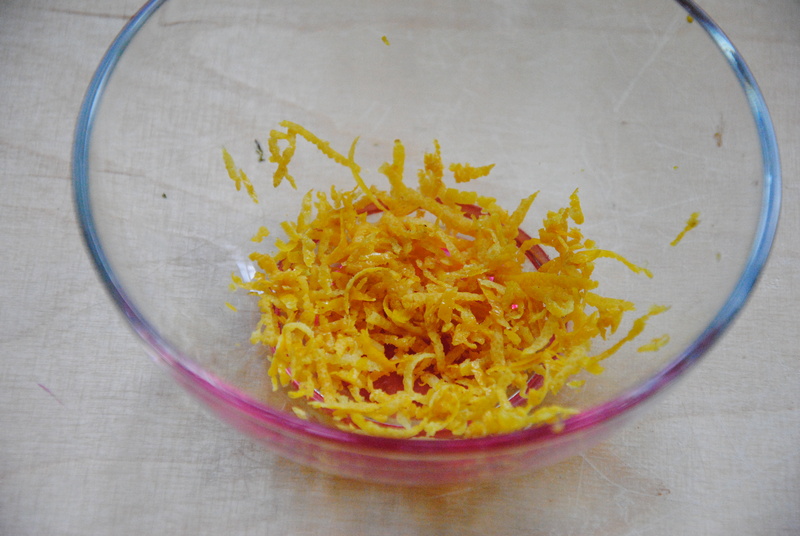 Two, we will need the zest from this lemon later in the recipe, so do yourself a favor and zest it BEFORE you juice it (it doesn’t work the other way around). 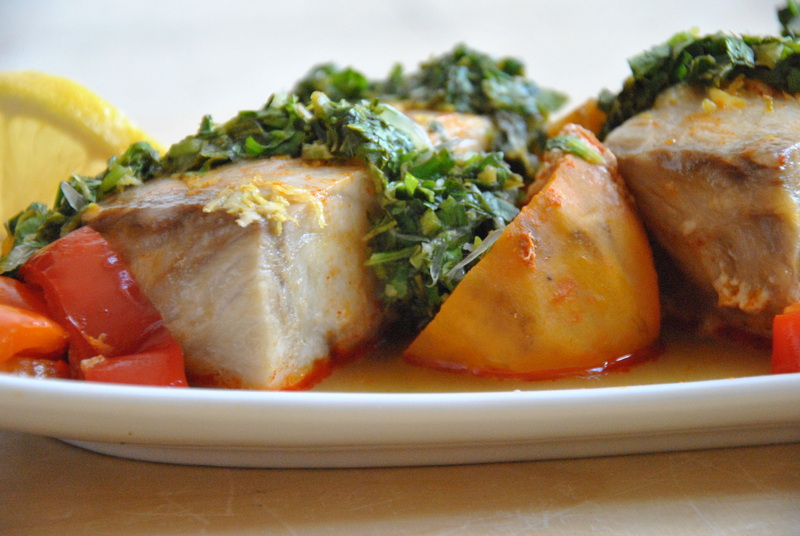 Now that we got all that fishy business out of the way, it’s time to prepare the vegetables. 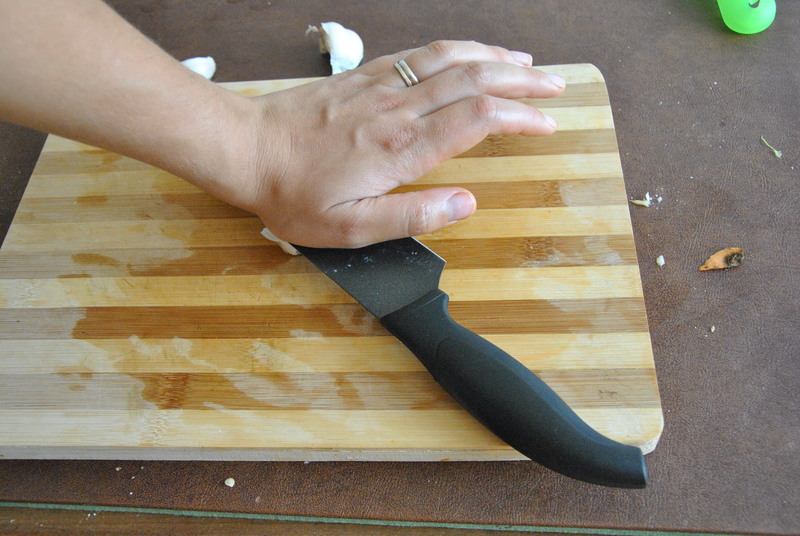 Peel and coarsely chop all the root vegetables. The authentic Moroccan dish only uses potatoes, but I like to make mine more colorful by adding sweet potatoes and other root vegetables that catch my eye. My mom has done it with purple yam recently, and reports a great success with the family. 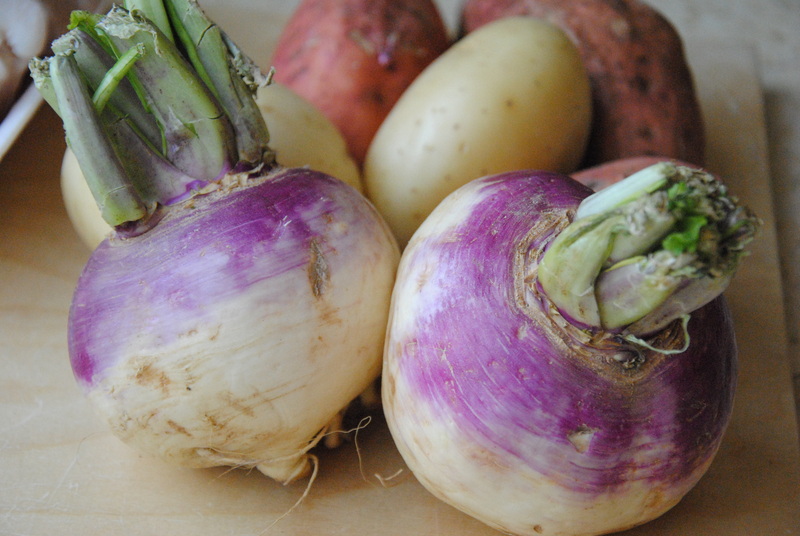 This time, my mind wouldn’t let go of these beautiful turnips I saw at the market – so in they went. I think leaving about 2/3 of the root vegetables on the full, starchy side and giving myself complete free reign with the other 1/3 works really well and the dish doesn’t lose from its original texture and flavor. 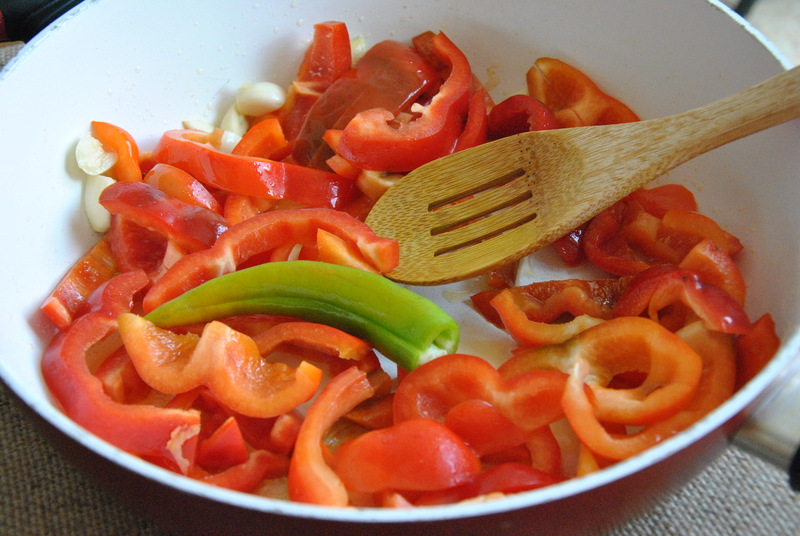 Cut the bell peppers into thin, 1/4 to 1/2 inch wide strips. 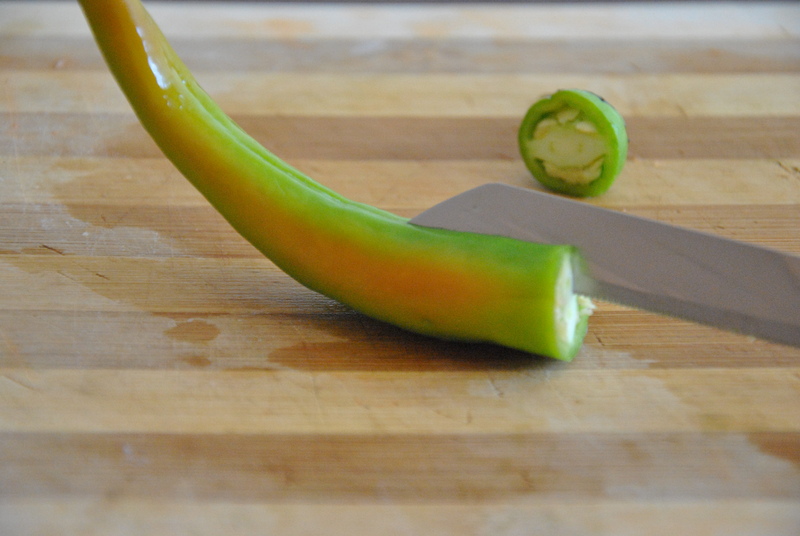 Cut the hot pepper lengthwise. If you want a milder flavor, rinse out the seeds. If you don’t mind your mouth going on fire (I sure don’t), leave them in. 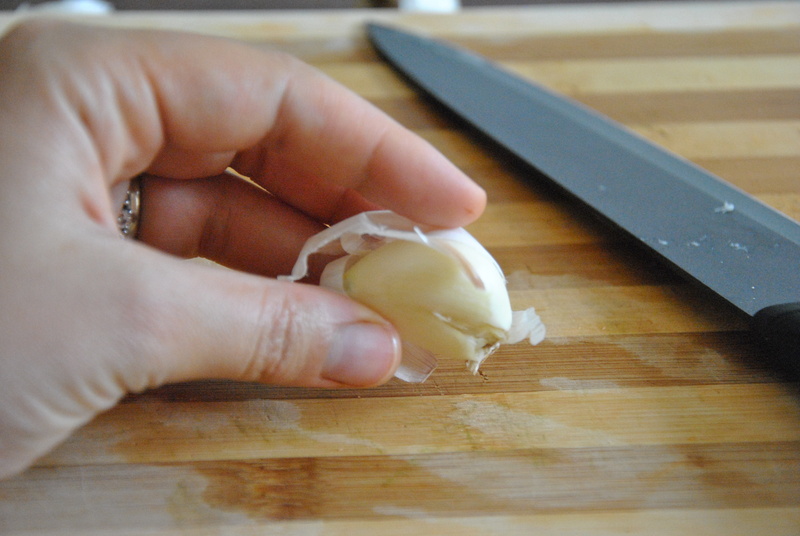 Peel the garlic and cut each clove in half. And SLAM! your hand down on it. 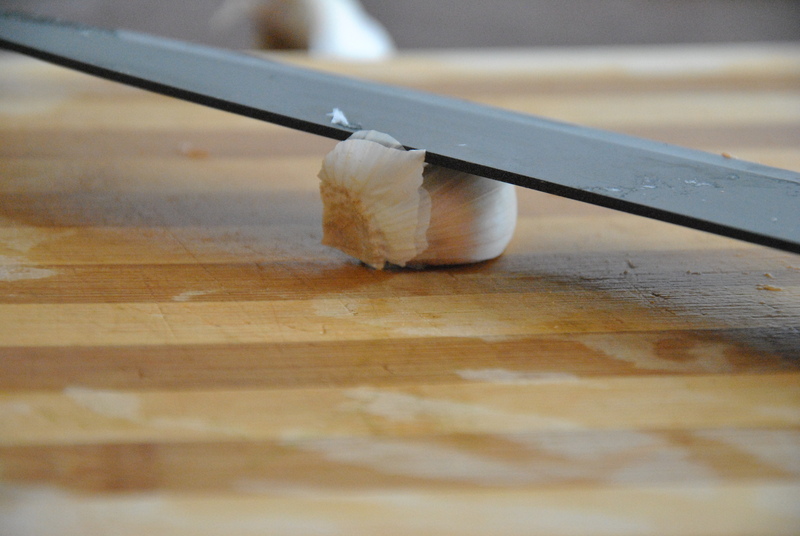 The garlic will understand it is dealing with a kitchen-ninja and try to escape at all costs, leaving its peel behind. Now that everything is properly chopped, we can finally cook. 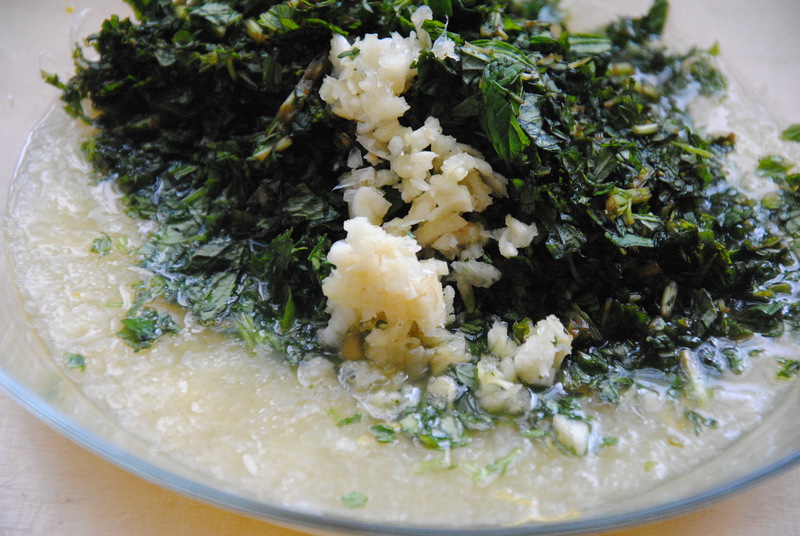 In a large, wide pot over medium heat, warm up 2-3 tablespoons of oil. I like to use 3 tablespoons of canola oil with 1 teaspoon olive oil because I love the flavor of olive oil but as it has a very low burning temperature, it’s not idea for cooking like this. Throw in the garlic and both kinds of pepper, and stir. 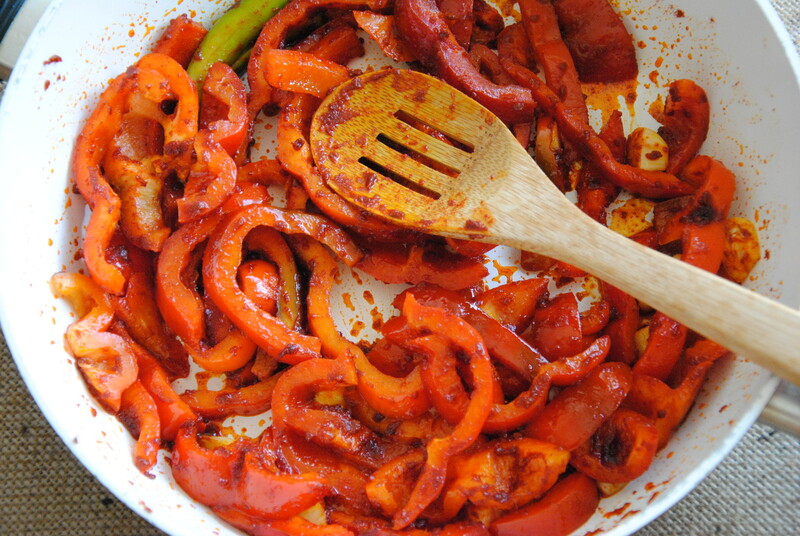 About five minutes later, add the paprika. Yes, you need a lot for this recipe. It’s basically “fish in paprika sauce”, so this is really not the time to be stingy about using paprika. Put in at least 4 tablespoons. Mix well. Add the root vegetables and stir until they are covered with pasty bits of oily paprika (and yes, I can make it sound even less appetizing). 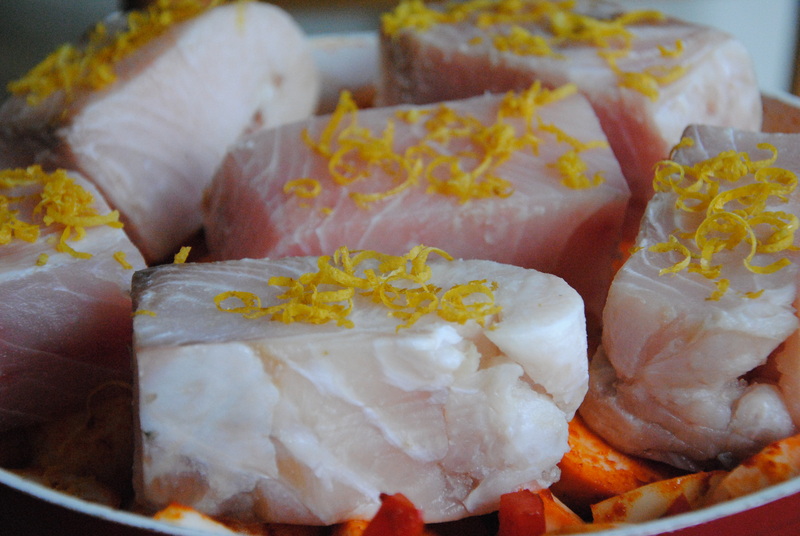 Lay the fish evenly on top of the vegetables. Try to make sure no one piece is covering another. 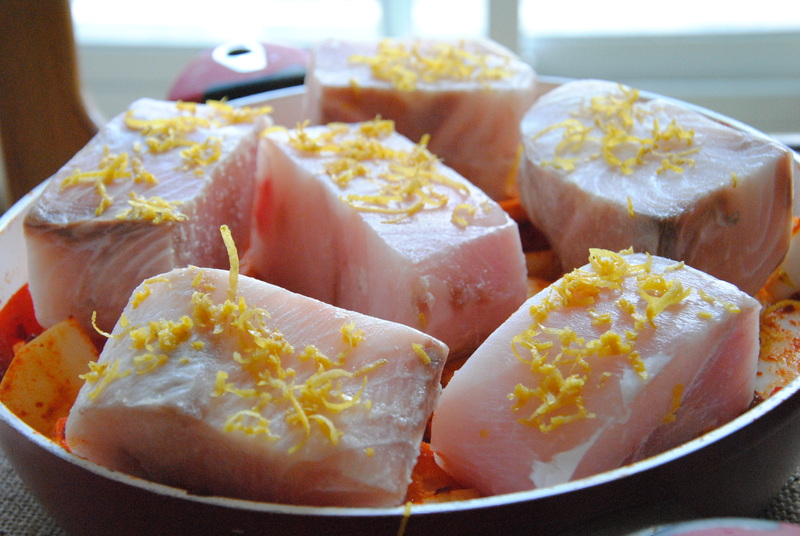 Zest the lemon evenly over each piece of fish (if you juiced your lemon and pre-zested it like I suggested, you are thanking me now. If not, you are wrestling mangled, squeezed lemon-halves, inevitably deciding you just need to use a whole new lemon, and bitterly thinking that NEXT time, you will listen to Mrs. Graceful). 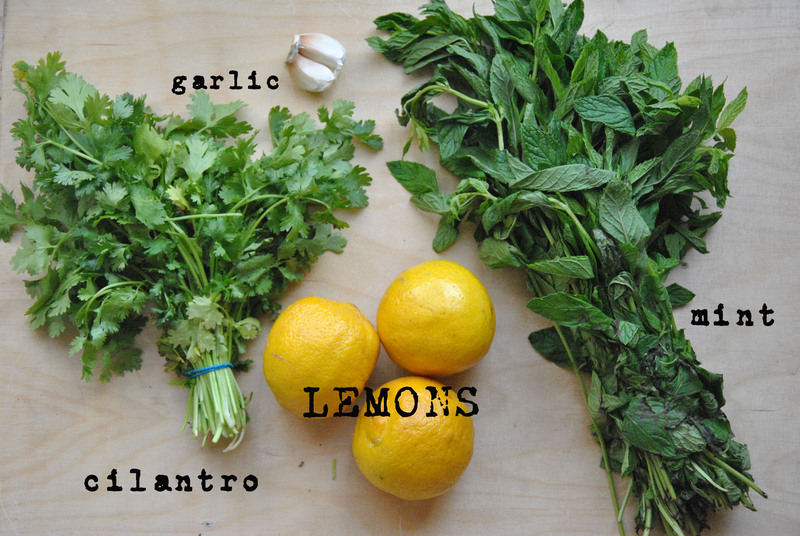 Wash the cilantro and throw it on top of everything in one bunch (take off any rubber bands / strings it comes with, but don’t take them apart – just leave all the stems together. Fill the pot with water until just below the fish. It’s a good idea to gently add the water from one side of the pot, so as to not cool down the entire pot and avoid washing the paprika off of everything. Bring to a boil uncovered, and then lower the heat and cook covered for about 30 minutes. 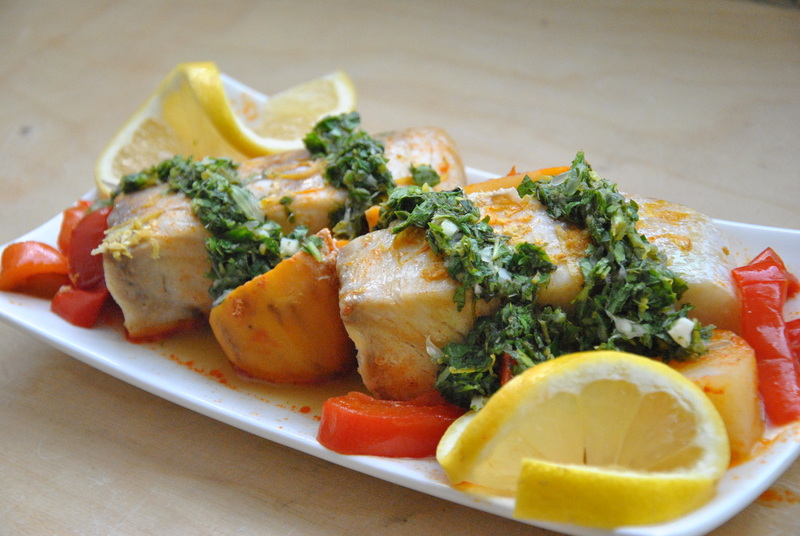 Serve with the lemony chimichurri below. 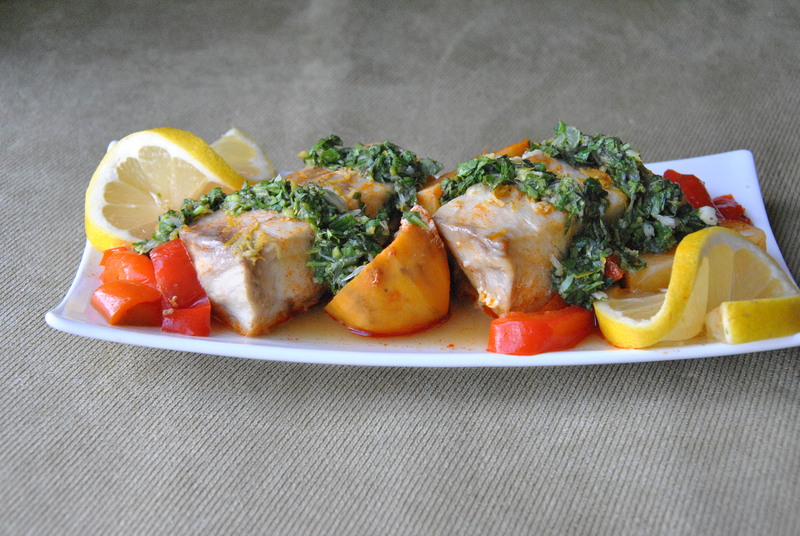 This dish goes really well with sweet challah bread. Zest two of the three lemons needed for the chimichurri. 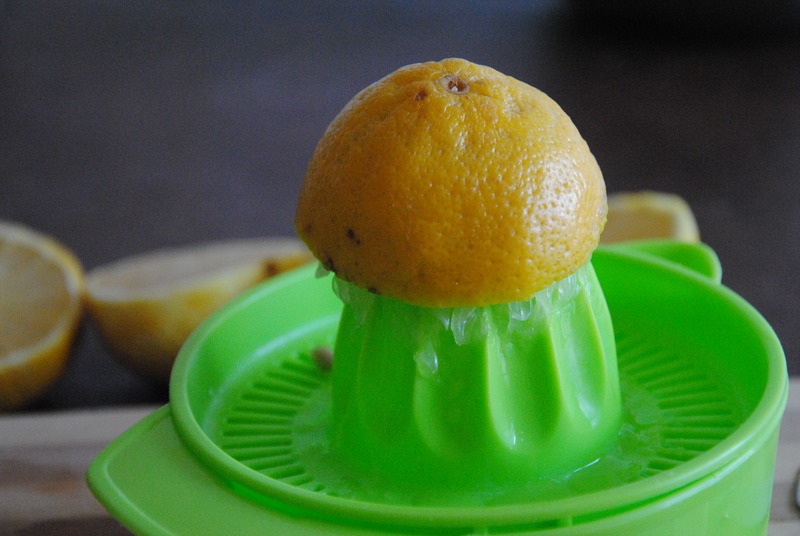 We’ve already been over this, so remember – first zest, then juice. Juice all three of them and mix in a small bowl with the zest. Use the pulp, as well. 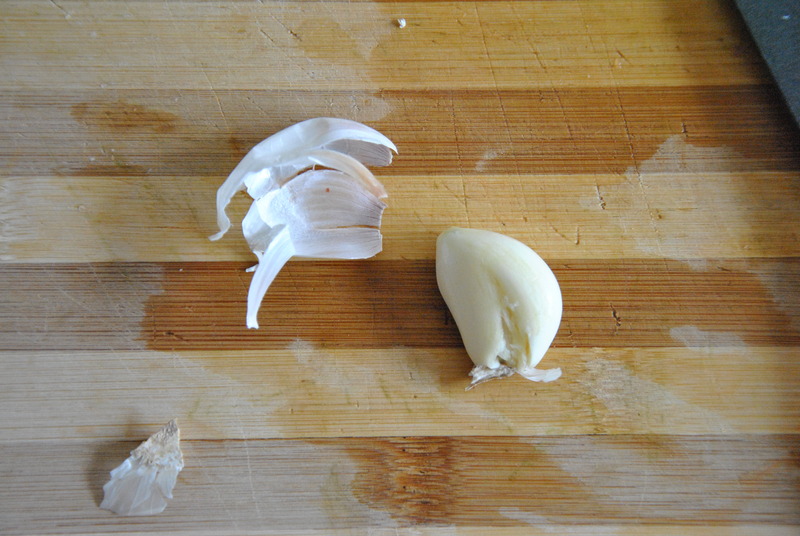 Crush the garlic and add to the bowl. 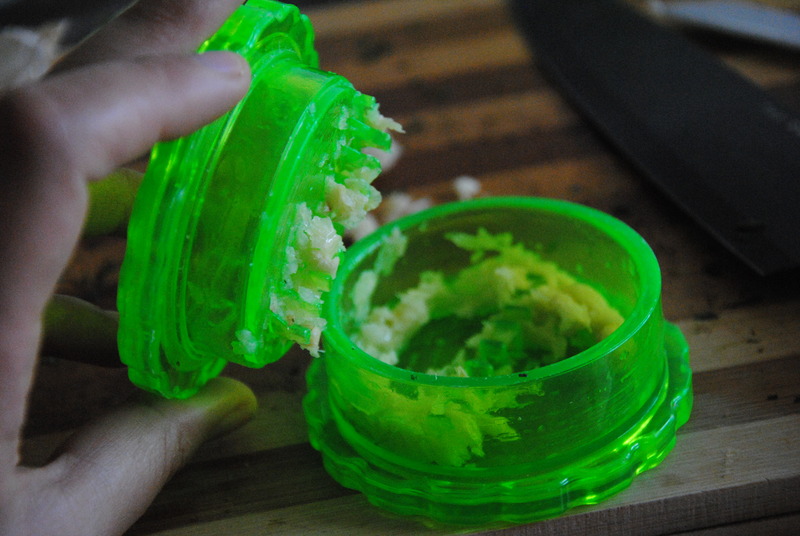 I’m pretty sure my garlic crusher would pass for drug paraphernalia anywhere outside of the kitchen, but we just can’t find a “regular” one that won’t break after three uses. 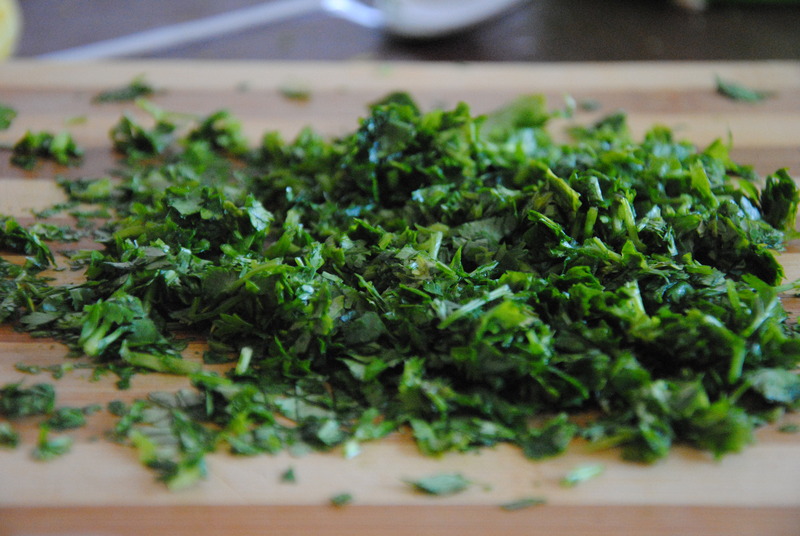 Wash and de-stem the mint and cilantro, and then mince and add them to the bowl. Stir everything well until evenly mixed. That’s it! 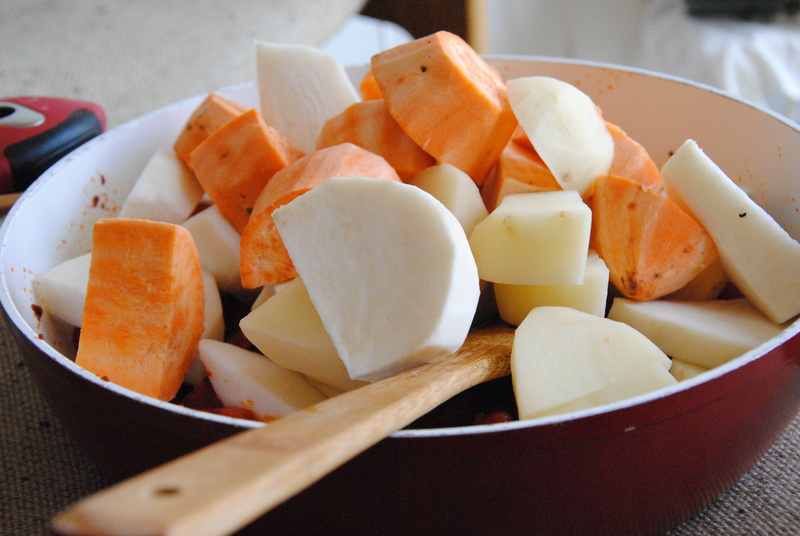 Peel and coarsely chop 3 medium potatoes, 2 sweet potatoes, and 2 turnips. 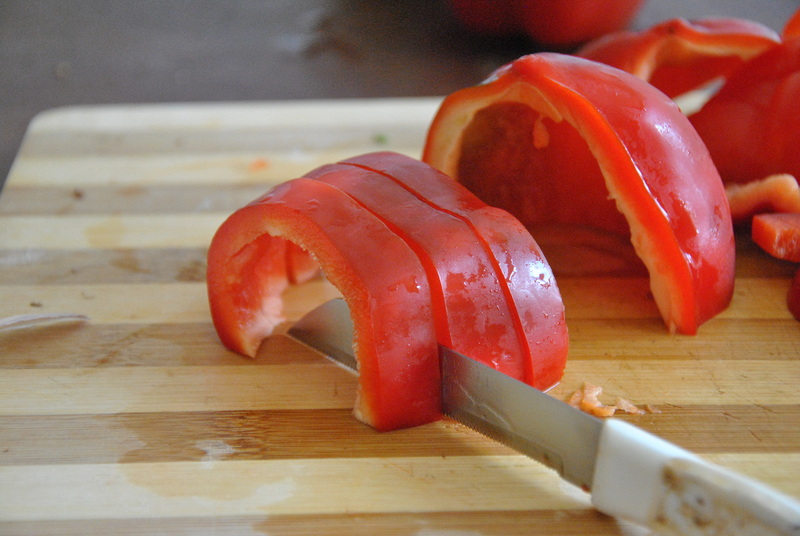 Cut 4 red bell peppers into 1/4 to 1/2 inch strips. 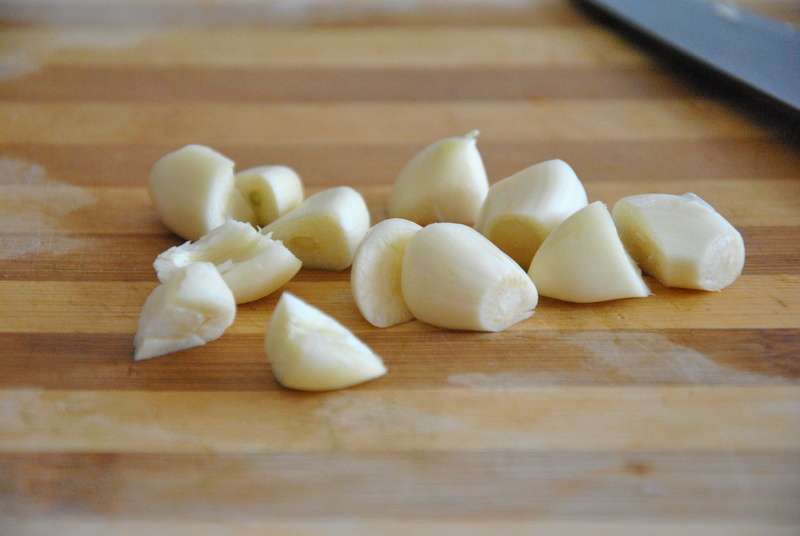 Peel 5 garlic cloves and cut each in half. Cut 1 hot pepper lengthwise. Wash seeds out for mildly hot, or leave them in for super-caliente. 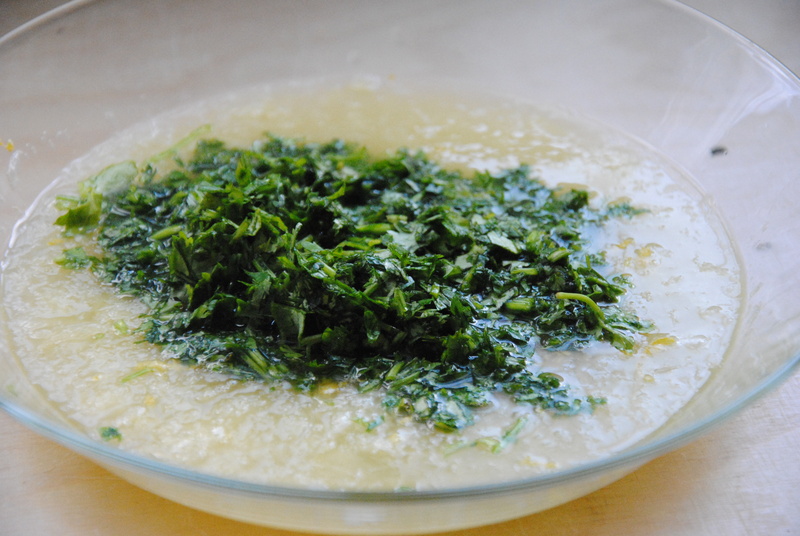 In a wide, large pot over medium heat, warm up 2-3 Tbs of oil. Add garlic and both kinds of pepper, cook for about 5 minutes. 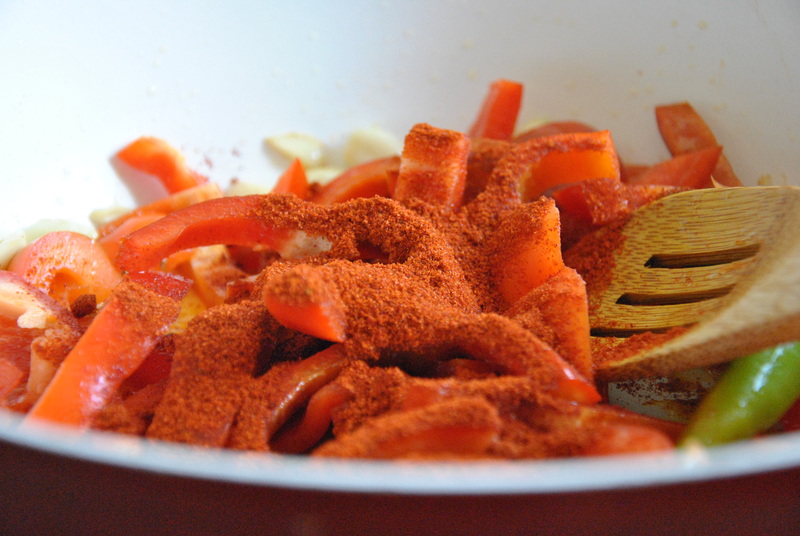 Add paprika (about 4 generous Tbs.) and stir well. 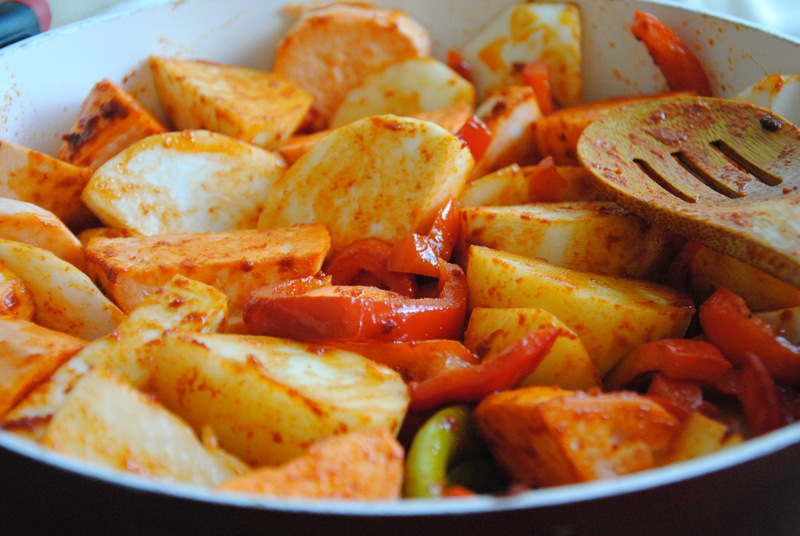 Add the rest of the vegetables and stir until they are covered with paprika. 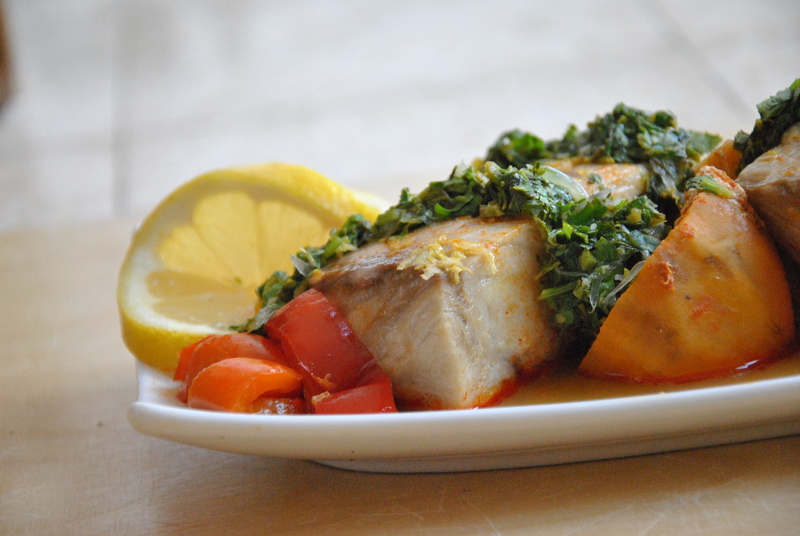 Lay 6 thick fish fillets evenly on top of the vegetables. 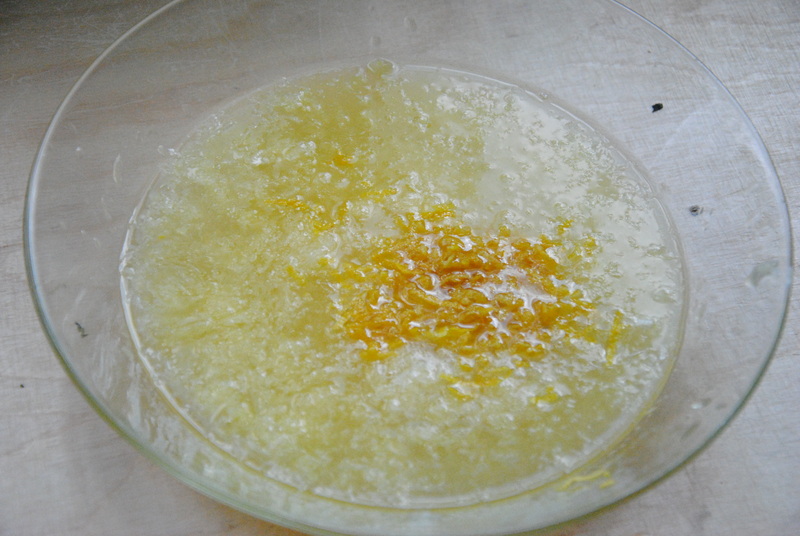 Zest the lemon over each piece. Add water up to just below the fish level. Throw 1 bunch cilantro on top. 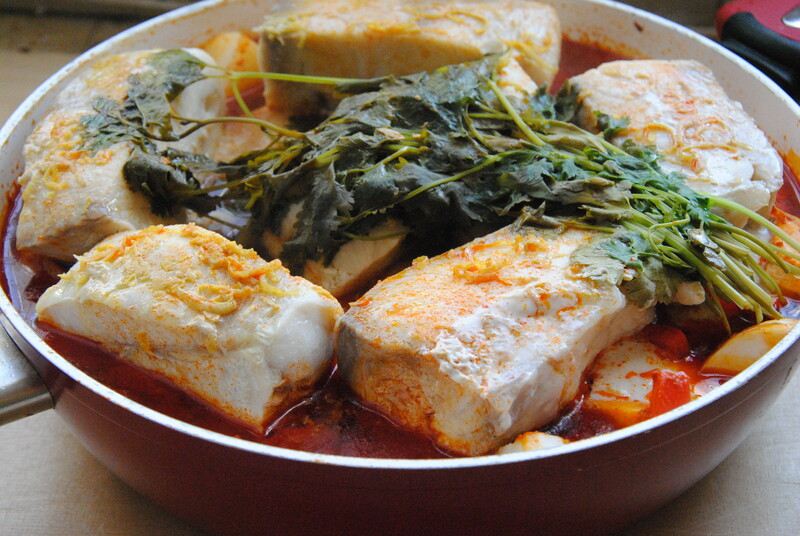 Bring to a boil, then cook covered over low heat for 30 minutes. Zest two of the 3 lemons into a bowl. 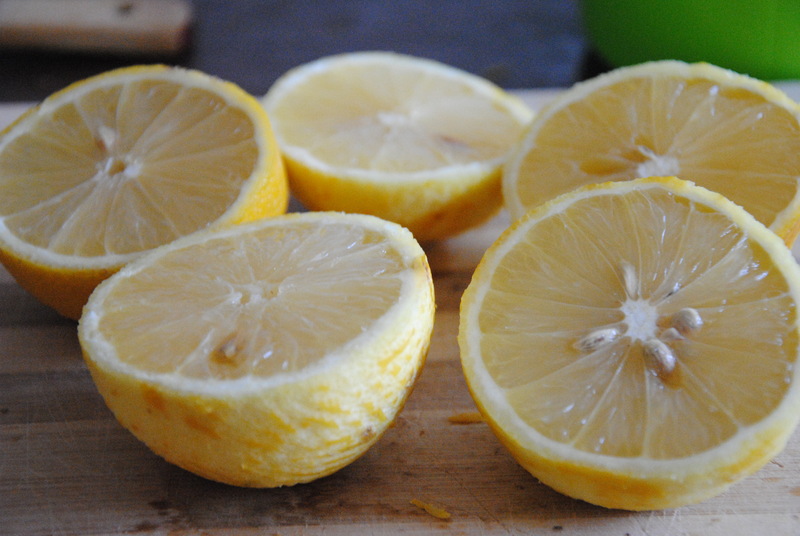 Juice all three lemons into the bowl. 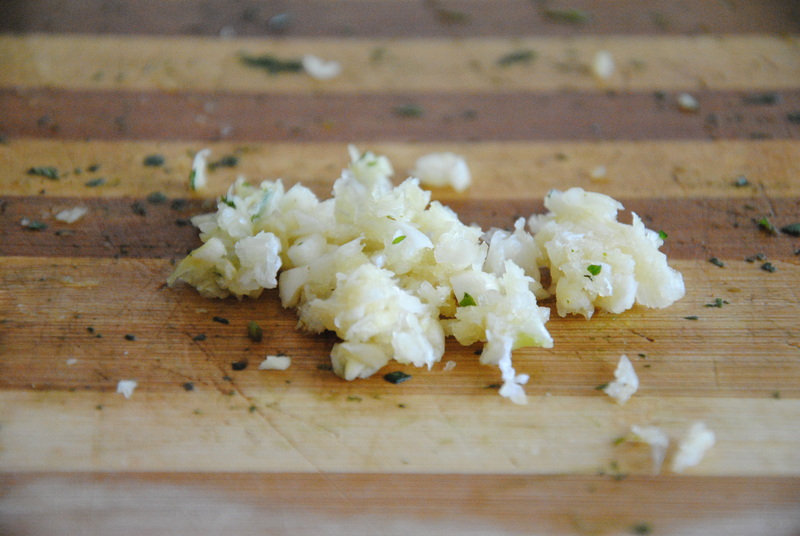 Crush 3 cloves garlic and add to the bowl. 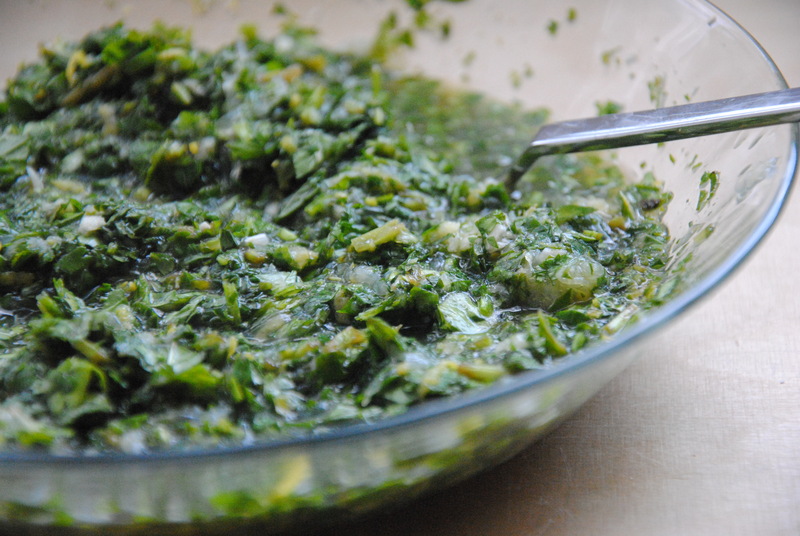 Mince the mint and cilantro and add to the bowl. Stir together until evenly mixed. This entry was posted in Main Courses and tagged almonds, DIY, gluten-free, homemade, Middle-Eastern, Passover, raw, special treat by Adi. Bookmark the permalink. wow! that looks like the yummiest think ever. do you think it will work as well without the red peppers? Thank you! I think it would definitely be delicious, but would take this dish even further away from its traditional flavors (the bitter-sweetness of the bell peppers really adds).